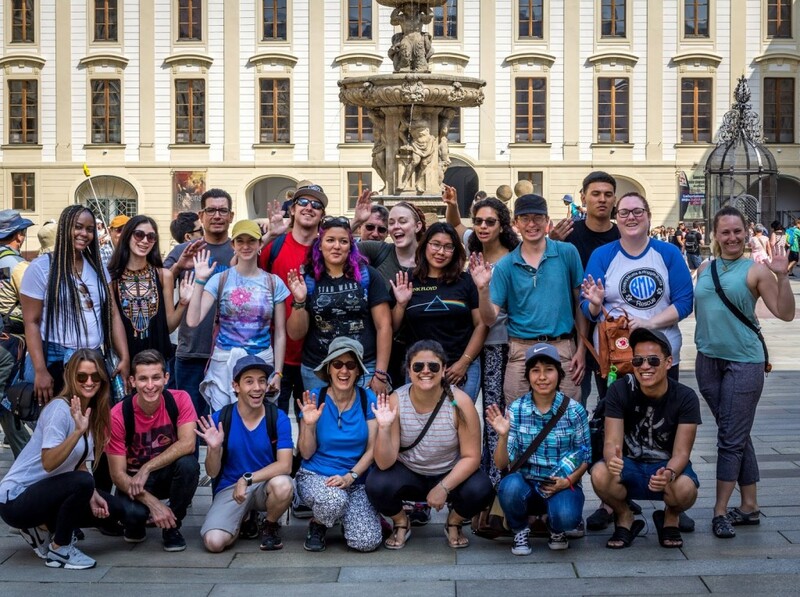 In May 2018, CSUN students and professors pose in Prague, during a two-week tour of European cities. In late May and early June, professors from CSUN’s Jewish Studies Interdisciplinary Program and Department of History led 16 undergraduate and three graduate students on a two-week trip to four different European cities — where they walked in the footsteps of history through castles, former ghettos and more. CSUN professor Jody Myers, director of the Jewish Studies Program and professor of religious studies, has organized several trips to Europe, specifically Poland, for CSUN students since 2011. With the help of associate professor of history Donal O’Sullivan, associate professor of Jewish studies Jennifer Thompson, the Department of History and the Jewish Studies Program, this year’s trip included destinations in Poland, the Czech Republic and the Netherlands. Students of all majors and backgrounds were eligible to participate. 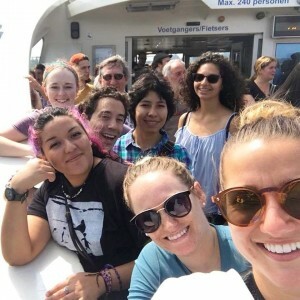 CSUN students on the European Cities trip take a ferry in Amsterdam, June 2018. The students chronicled their experiences, along with photos, on a trip blog that reflected the trip’s lasting educational impact. For example, history major and philosophy minor Samantha Ceja wrote that she loved having the opportunity to visit historic sites she had read about over the years. She called the trip an experience of a lifetime. Visiting the Auschwitz concentration camp in Poland was also a deeply moving experience for Ceja. This summer, the Younes and Soraya Nazarian Center for the Performing Arts (The Soraya) kicked off a large-scale collaboration between students in CSUN’s Mike Curb College of Arts, Media, and Communication and local and national artists to bring awareness to some of the challenges faced by the Los Angeles River. Viewed by many Angelenos as a concrete flood-control canal, the river is more dynamic than what meets the eye, project organizers said. The river has a vital ecosystem, a prominent role in the city’s history and geography, and, according to city leaders, a brighter future. However, most LA residents remain, at best, skeptical. CSUN faculty, staff and students involved in this new project aim to change that. The organizers hope to foster engagement and awareness about the river. This summer marked the first of the project’s four phases, which will span many months into 2019. Later this month, Neuman and Appleton will lead CSUN student dancers, artists and filmmakers to river sites along Frogtown — a small community cut off by the massive 5 Freeway and now inhabited largely by warehouses and light industry and nestled along the curving, soft-bottom section of the LA River just south of Atwater Village and west of Glassell Park. The group will harvest Arundo donax reeds, inspiring student creativity to tell the story of the river and document their experiences there. The project will continue this fall and into 2019, as students work on their Arundo instruments and sculptures, with plans for a kickoff event at the river in October and a multidisciplinary festival and performance on the common theme of the river in April 2019. The performance may involve choreography by dance students in CSUN’s Department of Kinesiology. CSUN student filmmakers also hope to produce documentary films about the experience, telling the ongoing story of the L.A. River. In early June, CSUN’s Nazarian College launched its first summer accelerator program for student ventures, open to students in all majors. More than 60 student teams applied for eight spots in the full-time program, according to Tim Tiemann, managing director of the CSUN Innovation Incubator. Under the guidance of Tiemann and Nazarian faculty and staff, student teams worked for 10 weeks on a product or venture in fields as diverse as robotics, ultrasonic radar, beer brewing and blockchain technology. The teams completed up to 100 customer interviews each, as well as worked on their product design, pricing and distribution. They each developed a company logo, promotional video and an investor “pitch deck” (presentation). The boot camp’s presentations focused on the theme of “Creative Strategy: Business of Design,” influenced by New York-based educator, activist and designer Douglas Davis, who anchored the week of activities and workshops for students. CSUN graphic design alumnus Aaron Atchison, founder and creative director of Pasadena-based branding agency Farm Design, kicked off the boot camp. For more on the speakers and presentations, visit http://intersectla.org/bootcamp18/. 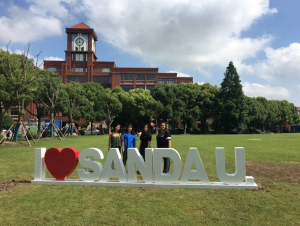 In June 2018, CSUN students from the David Nazarian College of Business and Economics visit Sanda University in Shanghai, China. Photo courtesy of the Nazarian College. In June, a group of 20 students from the Nazarian College traveled to China on an 11-day study tour, led by professor of management Daniel Degravel and assistant professor of systems and operations management Kunpeng Li. The group of students and faculty were hosted by Sanda University in Shanghai, a private university that serves about 13,000 students. The CSUN students visited cultural treasures such as the Yu Garden, the Shanghai museum, and the cities of Hangzou and Suzhou, near Shanghai. They also visited business-related sites such as the Supercomputer center in Shanghai and the SAIC Volkswagen plant in Shanghai Anting, as well as participated in discussions on international strategy and management consulting. Through case studies about Asian companies or American companies operating in China, students studied globalization and the strategic effects of the international operations. The CSUN undergrads had the chance to experience Chinese student life in Sanda University dorms, as well as exploring Shanghai during their free time. They wrote about their experiences, along with photos, on a trip blog. 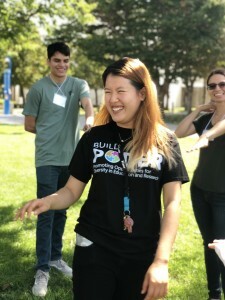 BUILD PODER staff member Amber Bui runs a group activity for Summer Jumpstart program students in July 2018. Photo courtesy of BUILD PODER. CSUN’s BUILD PODER staff led the fourth annual BUILD PODER Summer Jumpstart program this summer, introducing a new cohort of 68 CSUN and community college students to an undergraduate career in biomedical research. Over four weeks from mid-July to Aug. 10, students learned about critical race theory, social justice, public health, research methods, basic research skills in their respective fields, professional e-mail etiquette, professional attire, financial management, mentorship and coping skills. Staff created and led community-building activities to foster camaraderie among the group. They also organized a “Toxic Tour” field trip, exploring the most toxic sites in Los Angeles County to help the students learn about environmental injustice. Stops included the site of the former Exide Technologies battery recycling plant in Vernon. The Summer Jumpstart program staff and faculty included BUILD PODER principal investigators and professors Carrie Saetermoe and Gabriela Chavira, as well as Veronica Villasenor, Amber Bui, Mirranda Salas, Cathy Smith, Alina Adamian, Hansook Oh and Edith Gurrola. The BUILD PODER program aims to increase diversity in biomedical research and prepare participants for Ph.D. programs. BUILD is an acronym for Building Infrastructure Leading to Diversity, and PODER stands for Promoting Opportunities for Diversity in Education and Research. In 2014 CSUN became one of 10 sites across the nation that host the National Institutes of Health’s experimental diversity research program, BUILD. Students can apply in their sophomore or junior year to participate in BUILD PODER. Offering virtual reality (VR) tools to nursing students means they can practice a variety of health care scenarios that meld imagination and experience to make new discoveries. As part of a larger project to incorporate VR into clinical nursing education, CSUN assistant professor of nursing Laurie Gelardi engaged art, computer science and graphic design students this summer to design a VR program for nursing students to practice patient assessments. The final product will allow students to use VR goggles to interact with a virtual patient. Gelardi, along with Department of Nursing chair Rebekah Child and assistant professor of art Caleb Owens, worked with students to begin the project over the summer. Their first step was to create an application to practice respiratory and physical assessment. In the works: This fall, the group plans to add more apps that will allow students to use VR to practice complete physical exams and other nursing procedures and skills. 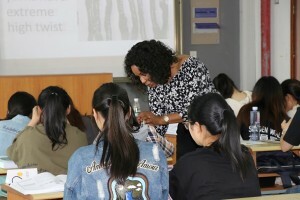 In June 2018, CSUN lecturer Shirley Warren teaches a fashion design class at Soochow University in China. Photo courtesy of Soochow University. In recent months, several professors in CSUN’s Department of Family and Consumer Sciences engaged with students in China for short-term exchange activities that have helped establish ongoing international collaborations. In early June, apparel design and merchandising lecturer Shirley Warren was invited to serve as a judge for the Student Fashion Show at Xi’an Polytechnic University in Xi’an, China. The panel of judges also included renowned Chinese and international artists and designers. Warren’s CSUN colleagues Uma Krishnan and Marine Boyadzhyan taught workshops in research methods and fashion design at the university as well. In addition to Xi’an Polytechnic, Warren taught two fashion design classes at Soochow University in China, for students who are part of the first cohort of a joint program between CSUN and Soochow. Thousands of miles away, Annette Besnilian — executive director of CSUN’s Marilyn Magaram Center for Food Science, Nutrition and Dietetics — taught a public health seminar, “Childhood Obesity: A Pandemic Health Crisis,” at the Turpanjian School of Public Health of the American University of Armenia.